A large, handsome, ginger tom, Leo has used up most of his nine lives. Abandoned at a week old he was taken, along with his sister Purdy, whom we also adopted, with the rest of his brothers and sisters to The Last Chance Rescue Centre in Edenbridge. When rescued they were suffering from malnutrition, anaemia, chronic flea infection, sticky eyes, and hair loss; and being so young they had to be hand reared. Even now Leo still lies in my arms like a baby, which is how he was fed, except he is now 11 years old! Apart from the abscesses from fights (always on his rear, the coward!) he has been run over, fallen from a tree, dived into a metre deep trench of wet concrete and been bitten by a snake! But four years ago he started to lose weight, his fur look unkempt and he was exhausted. After many fruitless tests he was on death's door when we finally discovered he had pancreatitis and diabetes. I don't know how he survived but with constant nursing and the help of his wonderful vets; he did. Initially giving the insulin injections was stressful and I hurt him, not once has Leo ever retaliated, in fact he has never hurt anyone, even at the vets he tolerates all the blood tests and still purrs. Now, Leo stops half way through his meal, stands and waits patiently while I inject him and then finishes his food! 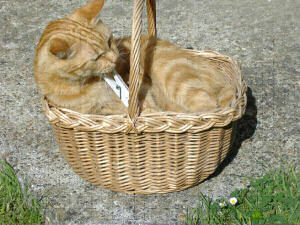 Earlier this year he won Senlac Vet's ‘Pet of the Month’ competition. On the back of that I entered him into the Cats Protection League's ‘Rescue Cat of the Year Award 2010’ and was totally amazed when he was chosen as one of the finalists in the Most Incredible Story category. This prestigious award ceremony will take place at the New London Theatre in the West End on the 4th of August where the winners will be chosen by a celebrity panel of judges. I don't know if Leo will win as last years winner fell into a combine harvester and survived! But regardless of that Leo will always be a winner to me, and I often wonder what would have happened to him and his sister Purdy if they had not been rescued. The actual awards were like the Oscars with each story and picture of the cat coming up in a large screen while the celebrity read their story. The audience gasped as our celebrity read out each of Leo's death-defying exploits! As for Leo's diabetes, he is very difficult to treat as he is a ‘transient‘ and sometimes his blood sugar is really high for a while as we try to get it under control and then sometimes he goes into remission which can last a couple of days, a week or longer. In his first year he actually came off the insulin for nearly eight months before the old familiar symptoms returned. I do not use a home blood glucose monitor. For me the insulin injections are enough for Leo to tolerate. The strange thing is that I have got quite adept at recognising very subtle changes in Leo's demeanor and I can normally tell where Leo is with his blood glucose on a daily basis and adjust his insulin accordingly, his vet finds it amazing. With that and the odd urine sample when I can get one, watching what he eats as I feed him on demand and the fructosamine testing we manage to keep Leo the happy, healthy and the unique character that he is. Nothing pleases me more then when I see him bounding round the garden with his sister or chasing the leaves around the patio.